Magnetic resonance imaging (MRI) is a non-invasive way to take pictures of the body. Unlike X-rays and computed tomographic (CT) scans, which use radiation, MRI uses powerful magnets and radio waves. At Virginia Mason we have some of the most experienced staff in the Seattle area using five 1.5T Siemens MRI scanners throughout our system. There are two mobile units that travel between our medical centers in Bainbridge Island, Lynnwood, Kirkland, Issaquah and Bellevue. There is a fixed unit at Virginia Mason Federal Way Medical Center and two units at the Hospital & Seattle Medical Center — one at the outpatient building and one in the hospital with 24-hour on-call service for emergencies. 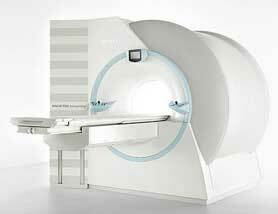 During magnetic resonance imaging (MRI), a table moves the patient into a large open cylinder. Once positioned, radio waves pass through a magnetic field around the patient, creating 2-D and 3-D images of the internal structures. The creation of these radio waves creates a loud knocking sound so you will be provided with headphones, through which we can play music of your choice. 7:15 a.m. - 6 p.m.